Moms use the park a lot! During my children’s toddler years my entire life revolved around the park. I had a love/hate relationship with the park. It was my office, as I took phone calls with one hand and assisted a newly walking toddler with the other. The grassy lawns and picnic tables were my kitchen table, feeding babies in the sun. For New York moms especially, it is our shared backyard. The benches are our lawn chairs. The trees are our landscaped garden. The sprinklers are our pool. But mostly it’s our urban living room where we connect with each other. It’s the place we realize everything we are doing as a parent is wrong and first join a support group. Then it’s the place we realize everything we’re doing is right because our child shares a toy and meets a first friend. It is well known that New York City maintains a tremendous park system—over 1,700 parks! But few know the real reason we find certain parks particularly enjoyable. Unique features or events are what bring in heavy usage. These things would not exist were it not for donations and volunteers, organized and spearheaded by community groups like Friends of Carroll Park and Friends of Cobble Hill Park. Maintaining the parks is hard work but luckily volunteerism is infectious. Often one volunteer encourages more. Spring is abuzz with park volunteerism as our parks need rehabilitation after winter. Here are some highlights from those efforts. Carroll Park recently held its much anticipated trash can unveiling ceremony. Garbage bags fittingly hid the inspired works, further building spectator excitement that had been fueled by internet leaks. Finally, the cans were lined up and officially revealed one by one. This is only the second time Friends of Carroll Park has enlisted artists to paint the cans. The project developed about 10 years ago when Carroll Park had a terrible rat problem. Did you ever have a rat jump out as you threw something away? It used to happen before they installed new rat proof cans. Unfortunately, the solution to the rat problem was almost as unattractive as the rats, so Friends of Carroll Park came up with the idea to make art of the new cans. In fact, former Borough President, Marty Markowitz liked the idea so much he borrowed it for Coney Island’s garbage cans. Since new trash can art only comes once a decade, I made certain not to miss the unveiling where I met some of the artists and their phenomenal work. It was an impressive showing across the board from all the participants. Among their ranks included a nine year old student, a textile designer, an architect, a mechanical engineer, an educator, a graphic designer, and a tattoo artist. Gary Dolan, President of Friends of Carroll Park, did a version of Seurat’s Sunday in the Park. 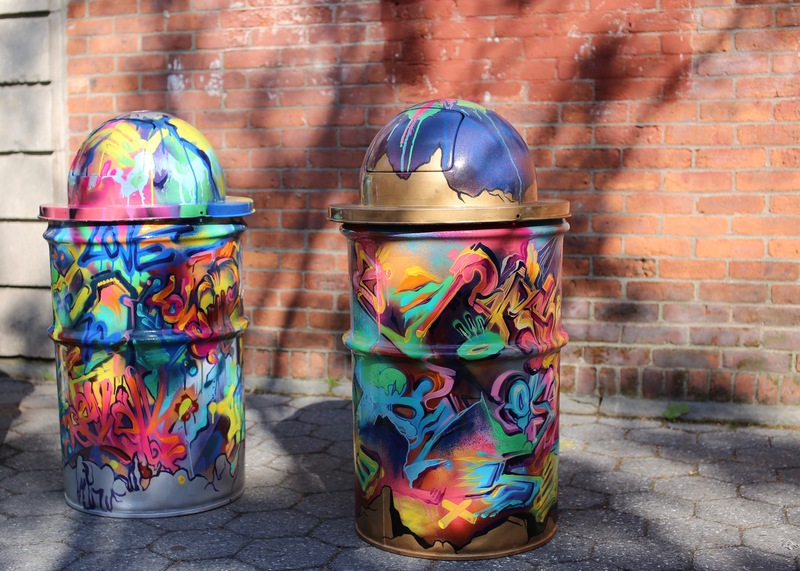 Lincoln and Antonio DePietro’s bright pink I love Trash is a pop-art stand out as are two untitled graffiti art cans created by Miles Wickham a.k.a. RESKEW, who is a teaching artist at the nearby Brooklyn Workshop Gallery. Nathan Caitlin’s iconic black and white pigeons and squirrels paired with the animated buildings of Adam Suerte’s Brooklyn Love spoke the local vernacular. Emily Sauer and Evan Abel’s Bright Skied and Fishy Tailed made me long for the opening of the sprinklers, while Meredith Hamilton’s Hats Off to Carroll Park summoned Brooklyn’s past. Enthusiasm was high at the event. 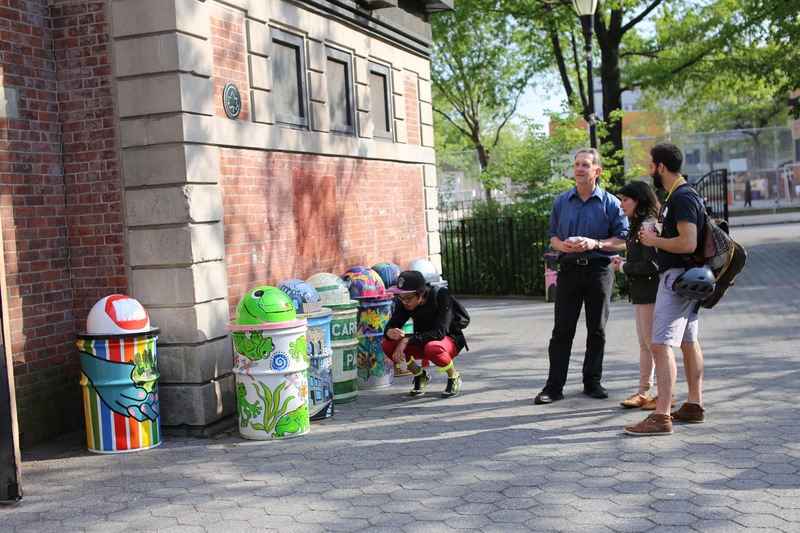 Blake Ferm, who created Forest in the Park stated, “What a great way to display your work for 10 years and give back!” However, the artist who received the imaginary Momtropolis trophy, possibly formed in the shape of the Williamsburg Savings Bank Tower, was Randi Teitel for her spontaneously renamed trash can Next Stop. I was impressed by both the concept and the way the artist painstakingly painted each and every tile on her subway station master-can. Captured for you here are the newly painted cans in pristine condition before the elements slowly take their toll. At nearby Cobble Hill Park, dozens of volunteers from Viacom turned up to paint the park’s perimeter fence. May 20th is Turn Up for Good—Viacom’s community day, when employees around the world spend the day volunteering. How Cobble Hill Park came to receive this crew is a story in vector volunteerism. Yes, that is a term I’ve just made up to describe a behavior in which one volunteer inspires others to join an effort. The Friends of Cobble Hill Park and Cobble Hill Association (FCHP/CHA) started this vector 30 years ago to support a park that is very heavily used and conversely very fragile. Beside old Verandah Place sits a tiny jewel of public space, where a large branch down can impact usage all around the town. The Friends weed, water, plant, clean and repair the park. The Cobble Hill Association underwrites that work and the event childhood memories are made of—the tremendously popular Halloween Parade as well as the summer concerts. Last year, FCHP/CHA and the Cobble Hill Tree Fund had the park’s entire tree population professionally surveyed and pruned. Increasingly the Parks Department is asked to do more with less money and fewer staff so many of these maintenance projects such as tree pruning can fall to the community. This year FCHP/CHA initiated the rehabilitation of the perimeter fence in coordination with Partnership for Parks/City Parks Foundation. Friends knew it would be a massive project involving community volunteers and organizations, but they didn’t anticipate the tremendous outpouring of help. John Parker of JP Interiors contributed, as did Mazzone’s Paint Store. City Parks Foundation fielded a group of 70 employees from Viacom and soon word came that Google was getting involved with a group of their own sponsored by a neighbor. Could this become a race of the media giants to complete the fence? Whether it’s garbage cans or fences it’s safe to say there has been a lot of painting going on at the parks this Spring. If you want to paint something at a park (not to mention weed or water) chances are there is a volunteer opportunity for you. If not, simply enjoy the park this summer but remember the volunteers who help bring in the extras! Next time you hang a lost shoe on the newly painted Cobble Hill Park fence, think of Friends of Cobble Hill Park, the Cobble Hill Association, the City Parks Foundation, JP Interiors, Mazzone’s, and the employees of Viacom and Google. Next time a rat doesn’t jump forth from a garbage can, you can thank Friends of Carroll Park. Then toss out your sprinkler soaked diaper and admire the artwork of over a dozen artists. Let the summer begin! I think I need to start a movement here in Hull! We have five playgrounds, most of them kind of old and yucky….we could use a little inspiration from the Brooklyn Parks!